“PLEASE Don’t Get Involved…” A former Mary Kay consultant warns of her sleepless nights – F.A.C.E.S. A long time ago…like 2005? I was “sharp”. I got involved with Mary Kay. I knew better but I did it anyway. The woman who recruited me was someone I met at the wedding chapel where I got married in 1999. She called me every month for years begging me to join her for a free facial or skin care class. I never took the bait and instead became a certified dog groomer and opened my own business. I made great money. Funny thing is SHE is the one who introduced me to the woman who initially trained me to groom dogs before I got certified. THAT’S where she pinned me. After I got establish grooming dogs, a job I LOVED, she brought her dog to me and one again tried to talk me into coming to a meeting. She said, “After all I’ve done for you, you could at least take an evening and MODEL our new line of products. What’s the worst that can happen? You have fun and go home with some free product”. Fine. I’ll go. Looking back, this meeting was the biggest waste of time in my life. I did my own make-up using products she laid out..along with 10 other guest who were also “Models”. Please. Then they paraded us around like show ponies for for 30 seconds and asked us how we liked the products. All of us tried to be enthusiastic and smile. “They’re great….” Whatever. How would you like a discount on these while earning a corp. income? Hmmm… tell me more. before the night was over I bought my starter kit. Siiiigggghhhhh. The next day, my director somehow talked me into buying this MASSIVE inventory to jump start my business. I regretted it the day it arrived. My husband tried to talk me out of doing it and I felt so guilty about going behind his back but I did it anyway. I couldn’t sleep, I couldn’t eat. It felt so wrong for me. I missed our family dinner every Monday to attend meetings and I hated that! It only took me a couple months before I promptly got UNINVOLVED with Mary Kay. I didn’t “fake it till I make it”. I sold the ridiculous inventory I was talked into purchasing to someone who did flea markets. It’s not because I was lazy or I was a quitter or a loser or I didn’t have a “dream” or believe in myself (their terms). It’s because IT was stupid, expensive, time consuming and people started avoided me. I got tired of missing dinner to attend the endless cult meetings I had to pay to attend, and hassling people to join me. I saw my director acting like a psycho every week trying to meet production and hounding my friends to death to sign up under me. (I gave her their numbers!!!) UGH! PLEASE don’t get involved with any type of dual-level, multi-level, or network marketing or whatever they want to call it. It’s all B.S. You will waste you time and SO much money are barely make any of it back no matter what they tell you or try to dangle over your head (car, bonus, etc). You have to constantly recruit and get those recruits to buy inventory or recruit to keep your car. It ISN’T free. You spend crazy amounts of time and money doing things to keep it. It’s just a 24/7 hassle and anxiety trap. There are easier ways to make money and nothing wrong with a real J.O.B. as they like to phrase it. Plus you keep your dignity. After I dropped out… every once in a while my director was so desperate she ordered inventory IN MY NAME to make it look like she was still meeting production. What kinda of J.O.B makes someone do that? How much debt does she live in? It’s not even about the products they peddle anyway. It’s about endless recruiting. No thanks. If you want make-up go to the drug store, Wal-mart, Amazon or the mall. (And BTW…That inventory sits on your shelf and never gets sold. Plus Mary Kay always phases it out right after you order it so you practically have to give it away because it’s no longer in the catalog). And, if it were REALLY about selling the products, WHY would you recruit your competition? 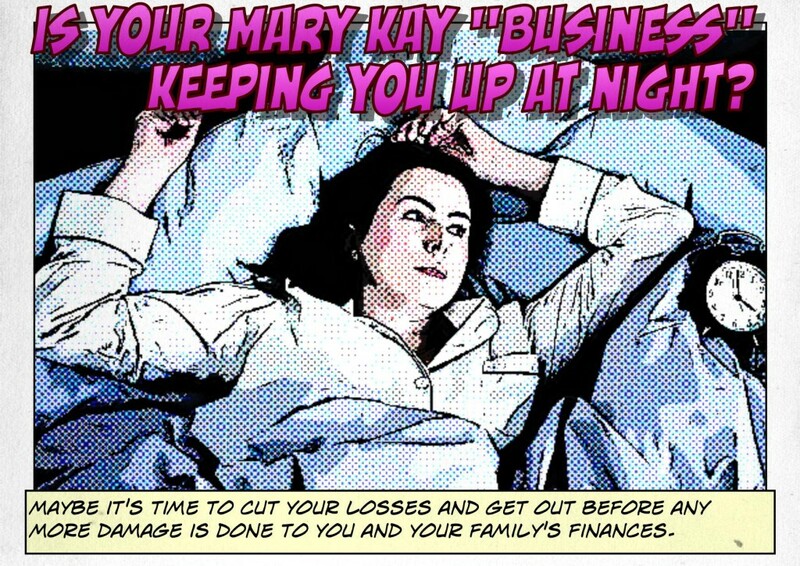 Wouldn’t you want to be the only one in your area selling Mary Kay? Seems like that is how you could make some money…IF it was about the products. Hello?? Same with protein shakes, work-out videos, totes, wrinkle creams, laundry detergent, scent warmers, kitchen gear, home decor, baskets, vitamins…you name it. And no matter what they say…None of it is THE BEST. That’s ridiculous. Then there’s seminars, conferences, meetings…all to hype you up to keep on keepin on lining the up-lines pockets. I’d rather just work and come home. No one buggin me about buying more sht or bugging people to host a party. Faking interest in people to tell them about the amazing opportunity…being told not to listen to anyone who is negative…LIE to your husband about the credit card debt or loans you have taken out…etc. Exhausting. Note: With the exception of formatting and minor edits, the content, comments and opinions expressed in testimonials are from the original submission. One Response to "“PLEASE Don’t Get Involved…” A former Mary Kay consultant warns of her sleepless nights"